Our mission is to educate people about animals and what it means to care for them. What does our mission mean to us? We want to help every cat and dog we can, to see as many as possible living in forever homes. We want to make homeless, hungry cats and dogs a thing of the past. We want humane treatment for all animals. We want to educate people about animals and what it means to care for pets. There is an enormous amount of work to be done. Yet we know that by working together, organizations like LOLA can help make these goals a reality. We provide homes for as many homeless cats and dogs as we can. This means feeding and cleaning up after them, taking them to the vet for preventative maintenance as well as when they’re sick. Of course, we also make sure they have playtime and attention. 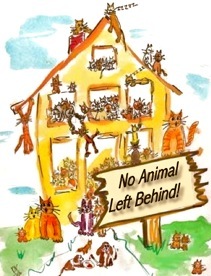 Most of the animals in our care are abandoned pets. But we also provide space for feral cats who have been displaced from their “homes”. We try to create an environment that is as close to a real home as we can get. We hold adoption services each weekend where we offer kittens and adult cats for adoption. All the cats and kittens we adopt out have been spayed or neutered, and all are current with their shots and vet records. We don’t hold adoptions for dogs at PetSmart, but there are always several strays who have temporary homes with us. It has been proven that spaying or neutering cats and dogs is the key to getting their populations under control. Each month we help to trap, neuter and return feral cats to their living areas. This Trap Neuter Return policy greatly reduces the numbers of unwanted cats. We also provide information about free and low-cost spay/neuter clinics, helping low- income families who can’t afford to spay or neuter their pets. We believe that the biggest impact on the problems of unwanted animals is going to come through education. LOLA works to educate people about the responsibilities of pet ownership, the cost of unwanted kittens and puppies, and the suffering this brings. Maureen and Gerard give talks when and where they can, and host tours of the sanctuary. We also provide information free of charge through our web links and printed materials.